Google may have said that its Google Play Music App for iOS would be released in a few weeks many months ago, but it appears the delay is finally over as it hits the App Store and features a 30 day free trial of the All Access service. 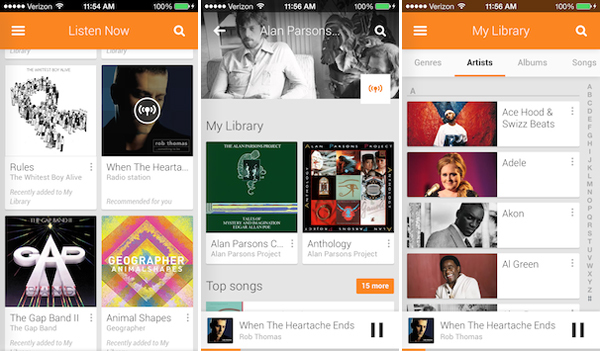 Google Play Music is Google’s answer to iTunes in the Cloud and allows a user to upload or match their purchases and own library against Google’s repository of music in the Play Store. This music can then be accessed on an Android device, and unlike iCloud, can be accessed via the browser, allowing a user to store up to 20,000 songs. The service was then expanded to not only an upload/match replay service but to offer what was called All Access which was similar to what Spotify and Rdio offer whereby unlimited music can be listened to ad-free. The good news for lovers of Google Play Music is that the service can now be accessed via your iPhone after Google released a dedicated iPhone App. The App can be loaded onto an iPad, but isn’t optimised for a bigger screen. The Google Play Music App for iOS is pretty much identical to that offered on Android, except I could find my auto-playlists such as Recently Added songs on the iOS counterpart. All Access is available for $9.999 per month, but a free 30-day trial is available to test out the service. The standard upload and sync service which mimics the functionality of iTunes in the Cloud is free up to 20,000 songs.